Amy Protexter has always been fascinated by ideas. As a history major at Augustana College, she noticed the way a single idea expresses itself in different forms through in society. Her talent for connecting those ideas into a compelling message led her to a master's degree in executive leadership from the University of Nebraska. Her success at leading change brought her to Insight, where she guided the company's 2015 global rebranding and distills its message through some of the channel's most compelling digital marketing strategies. Amy started her career in healthcare, challenging the status quo. As SVP and chief marketing communications officer for Alegent Health - and later with Vanguard Health Systems - she led efforts to push healthcare systems to a more patient-centric model. In 2012, Amy took her innovative approach into education. As VP of marketing at Edgenuity, she led a renaming and rebranding of the digital learning provider. Amy joined Insight in 2014 as VP of marketing, and was promoted to SVP North America marketing in September 2017. A lifelong learner, Amy applies the latest marketing ideas to the global rebranding (her fifth) and supports Insight's identity as a problem-solving provider that puts the client first. Insight has been on a transformational journey the past five years, as have many businesses around the world. In her role as SVP, Amy touches many parts of our organizational transformation strategy. She has led her team of more than 100 to: -Drive a strategic repositioning of the company from a reseller to a true intelligent technology solutions provider internally, and with clients and partners; -Develop a highly sophisticated digital marketing stack comprised of 42 integrated tools and applications that led to the generation of nearly $600M in marketing led pipeline, and $236M in closed revenue in 2017. -Create an Omni channel customer experience by opening up new avenues of connection like chat, AI fueled bots, social, self service capabilities for clients and more. -Drive deep optimization of SEO, leading to 800K organic visits to insight.com, up 44% YOY -Increase revenue production from organic traffic by 35% YOY -Publish nearly 200 pieces of content, produce more than 130 videos and generate 479 thought leadership earned media placements in 2017, a YOY increase of 111% Her team's success has resulted in a significant increase of partner investment in Insight's marketing capabilities, up 19% YOY. With the completion of several strategic acquisitions, Insight is now a unique partner in the channel, able to help our clients both manage their technology spend today, as well as transform for tomorrow. Through our four solution areas -- Supply Chain Optimization, Connected Workforce, Cloud and Data Center Transformation and Digital Innovation, we can help our clients take time, resource and spend out of their technology supply chain efforts to allow them to focus on future innovations to drive growth in their business. These efforts are resulting in significant category growth for Insight. In this past year, Amy received one of the highest honors of all - a promotion to Senior Vice President of North America Marketing for Insight, and a formal role as the global leader for Brand and Digital Marketing Strategy. She truly has a seat at the table of our organization, helping drive transformation. 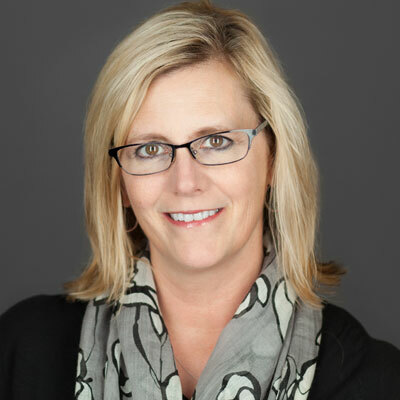 Amy was also recognized last year as a "Woman of the Channel" and is a often sought after speaker for Partner and Marketing Leadership events, providing keynote talks on brand, digital marketing strategy and leading change. Shonda Rhimes, creator of hit TV shows and author of the "Year of Yes: How to Dance it Out, Stand in the Sun and Be Your Own Person." Shonda's work in television has brought dozens of "real life" characters to the screen... characters who look more like society than most entertainment - strong women, strong Black women, women who make mistakes and fail, but who recover and go on. Women who are nurturing mothers, loyal friends, and smart business women. Her book, too, was an empowering read about being willing to take chances and just say YES. As hard and uncomfortable as it might be, be sure to seek out others who are different from you and can bring different skills, talents and opinions to the table. Leadership is the ability to turn those disparate talents and perspectives into something greater than the whole. And there's nothing more rewarding than seeing people exceed even what they believed possible for themselves given the right environment on a team. You may think this is a stretch, but I would like to master the skill of Meditation. From everything I have been reading, it can help you be calmer, more productive, more focused and more balanced. We live in a crazy, sometimes scary world... and being able to find that inner calm that can help you lead through change and tumult in a more effective way is something I would truly like to master. Eleanor Oliphant is Completely Fine by Gail Honeyman. This book is about a very solitary and lonely young woman that stumbles, falls and emerges stronger and in a better place than before. I enjoy reading fiction to bring balance to my life because it is often a very "non fiction" world that I live in. I found myself rooting for Eleanor every step of the way, as unlikely of a hero that she was. I highly recommend this book for pleasure reading!